Today, the activities of organizations in a dynamic environment are of great importance and human resources significance as one of the effective capitals has much received attention. In the past, rare resources, technological superiority, patent and state regulations were competitive advantages. The technology development, rapid innovation and elimination of regulations led into the abolishment of this restriction. In the current environment requiring flexibility, innovation and speed in market, development and knowledge management of employees, experiences, skills, and specialization (as called human capital) as effectively are the key success factors of sustainable organizational performance. Normally, the consideration is given to economic capital including financial and tangible assets as factory and equipment, but current ambitious managers besides recognizing the importance of tangible assets, materialistic data and resources, recognize nontangible human capital which is called intellectual capital. Organizational climate is defined as organization feeling or collective entity. Organizational climate is the quality of internal environment of organization and is described with some attributes as open, lively, relaxed, informal, cold, impersonal, hostile, rigid, and closed. It refers to flexible behaviors and effective, dynamic, and purposeful human relations as creating constructive educational climate. It is positive interest and behaviors of manager to members. It refers to inflexible behaviors of manager to members. It is administrative and irrelevant behaviors with educational goals as creating barrier instead of facilitation. It refers to the behaviors creating strong social relations between co-workers. It refers to the behaviors increasing the professional interactions of staffs. It refers to the behaviors except professional and educational activities along with personal goals. It is the climate in which openness of behavior models of chief and employees is at high level. It is the climate in which openness of behavioral model of chief is low but openness of behavioral model of employees is at high level. It is the climate in which openness of behavioral model of chief is high but openness of behavioral model of employees is low. It is the climate in which openness of behavioral model of chief and behavioral model of employees is low. It refers to a model of going beyond the minimum required level of voluntarily presence, management, and holding resources of internal protection. It is explained as following of employees of policies and job explanation of organization not for personal reasons, but based on organizational benefits. It refers to participation of employees in organization activities to improve skills and increase experience for effectiveness of organization. It refers to the ability of staffs in adapting with hardship at work place, without any verbal or formal complaining. It refers to voluntary actions by employees to help each other to solve the problems or avoid work-related works. It refers to participation in political events and processes of organization. Loyalty to organization and leaders of organization as a whole beyond the benefits of people is group and organization work. Seven-component model of OCB is a type of OCB as raised by Kerondle. In his latest study regarding the effect of OCB on organizational performance, he considered seven components as main symbols: Helping behavior, organizational compliance, sportsmanship, organizational loyalty, individual initiative, civic virtue, and self-development. In Kerondle model, most mentioned variables are consistent with other presented models and this model is the extension of Organ and Podsakoff model. In this model, organizational acceptance is similar to conscientiousness in other models. Podsakoff et al. stated seven dimensions of OCB: Helping behaviors, sportsmanship, organizational loyalty, organizational obedience, individual initiative, civic virtue, and self-development. Helping behavior is one of the important dimensions of OCB. In education department, voluntary aids can promote educational missions and goals and altruism between co-workers and friendly collaboration are provided. Sportsmanship, tolerating educational problems, and lack of blame can promote optimism among employees and without any expectation, duties are performed well. To improve the organization position before external employees, loyalty to organization has great position. When staffs maintain their work and ethical commitment even under hard conditions and perform their duty honestly, strengths of organization are increased and weaknesses are reduced. Organizational compliance is one of the fundamental concepts of OCB. When accepting the rules of organization in education is internalized and rules are performed without any control, it shows that staffs work friendly and they are considered as good organizational citizens. Individual initiative and using creative, voluntary activities, and innovative designs in educational environment can improve personal duties and improvement of organization performance and this causes employees to do their duties voluntarily. In civic behavior dimension (civic virtue), responsibility in organization indicates interest and commitment to organization as raised based on participation in the activities of organization and in this case, a person can consider himself/herself a part of greater whole and he/she is responsible to organization and society and he/she makes efforts to achieve organization goals even with personal costs. Self-development is the key OCB. Voluntary behaviors to improve knowledge, skill, and ability can develop individual participations in organization and to improve effectiveness of organization, employees should use this behavior appropriately. In general, the researches in OCB are of three types: Some of them are based on prediction and empirical test of existing factors and some factors including job satisfaction, organizational identity, organizational justice, and organization trust are recognized as facilitating factors of this concept. Another group of studies focuses on the outcomes of mentioned behavior and manifest their special works in dependent variables as organizational performance, effectiveness of organizations, satisfaction, customer loyalty, and social capital, and a few researches mostly focus on concept and its identity and by factor analysis methods have created standard to evaluate OCB. In organizational learning era and knowledge-based economy, an organization can turn knowledge and learning to competitive culture and advantage and develop it in all levels as its employees are mostly inclined to share their knowledge with others and consider the organization as a part of their life. Indeed, one of the reasons leading to the success of current organizations is that employees are not restricted to formal roles and perform beyond the duties. The study of Shaymy et al., "analysis of the effect of perceived organizational climate on citizenship behavior on nurses of Noshahr town" showed that by establishment of positive work climate, we can improve OCB via perceived organizational climate. Thus, improvement of organizational climate is proposed. Thus, involved people in co-operative activities can help the co-workers in better assignment and they are motivated to make efforts and when the organization presents innovative climate, the employees can easily start innovation and promote themselves. The results of the study of Aghaee et al., "study of the relationship between job burnout, OCB, organizational climate, and organizational culture in Iran Khodro Dizel" showed that organizational climate was effective on job burnout and OCB. Thus, based on the two-way relationship between organizational climate and job burnout, we can say the higher the good organizational climate, the less job burnout and the more OCB and vice versa. Amini performed a study on organizational climate with OCB among employees of sport organization of municipality in Tehran. The results showed that there was a positive and significant association between organizational climate and OCB. Organizational climate predicted OCB. Safarzadeh et al., in a study, "innovative organizational climate and job excitement with civil virtue in female employees among an industrial organization in Ahvaz City" found that there was a positive and significant association between innovative organizational climate and civic virtue in female employees. Ahmadizade performed a study on the effect of personality features and organizational climate on OCB. The results showed that there was a positive and significant association between organizational climate and five dimensions (organization goals, role in organization, rewards in organization, procedures and communication in organization) with OCB. The multiple regression results showed that among personality features of conscientiousness and extraversion and among organizational climate components, organization goal and communication was the best predictor of OCB. Zamani moghadam et al. performed a study, "evaluation of determination of moderating role of intra-organizational factors (organizational climate) on the relationship between OCB and organization performance in physical education offices of Tehran Province." The results of study showed that organizational climate adjusted the relationship between organizational citizenship behavior and performance and organizational climate as directly and indirectly had positive effect on organizational citizenship behavior. Sabzipour et al. performed a study as, "analysis of the relationship between organizational climate and attitude variables and behaviors among librarians." The results of the study showed that there was no significant association between organizational climate and OCB of librarians of public libraries of Iran. Feizi and Emadi performed a study, "the relationship between organizational citizenship behavior and organizational climate in ministry of sciences, research and technology." The results of the study showed that OCB had a positive and significant association with organizational climate. Cilla Michael conducted a study as, "study of the relationship between OCB and organizational climate for creativity among students of Metropolitan University in North of California." He found that perception of employees of creative organizational climate was associated at average with OCB s. The employees with creative organizational climate have high social relations and internal motivation to do the duties. Also, perception of employees of organization with developed and supported climate can lead to people creativity. Dipaola et al., in a study, "the relationship between OCB to school climate" found that there was a positive and significant association between these two variables and by encouraging OCB and performance improvement methods, good work place is provided for people. In information technology era, creating a suitable environment for staffs as interacting easily and study of the behavior of employees at work place with the aim of achieving the behaviors increasing efficiency and effectiveness of organization are the processes taking the attention of managers of organizations to make progress with the changes of present world. This requires the employees collaborating with high inclination and making efforts above the duties to solve the organization problems voluntarily, be committed and loyal to organization, and use any opportunity for the growth of themselves and the co-workers. If the organization goals are clear for employees, they can be effective on goals considerably and organization goals reflect the desires of people about organization. Thus, people can dedicate their time anxiously to other people with work issues and they are inclined to education and collaboration with new entrant employees. These behaviors can avoid work problems and they can tolerate hard conditions without any complaint and they are supported against external threats. Without the inclination of employees to collaboration, organizations cannot start development and effectiveness. The difference between voluntary or obligatory collaboration is of great importance as in case of obligation, a person performs his/her duties based on rules, organizational standards, and legal requirements. In informed collaboration, people use their energy, vision to develop their personal abilities and even for the benefit of organization. In the current era, organizations are encountered increasingly with dynamic environments and for their own dynamics they are obliged to adapt themselves with environmental changes. In other words, based on increasing speed of scientific changes, technology, social and cultural, successful and efficient organizations are those that besides adaptation with current society changes can predict the changes in future and can guide these changes to create good changes to make a better future. The investigation of OCB and its association with organizational climate can be presented as a useful tool for managers and authorities to determine the improvement of attitude of members, high interest in work, job satisfaction, and improving climate, and based on the significance of OCB in promoting organizational goals and its role in creating intimate climate, the main purpose of this study is to evaluate the relationship between organizational climate and OCB in staffs of educational department. As the education department staffs are the initial authorities of education of adolescents and the youth, the performance of its employees in cultural, educational, and social dimensions can be effective. The employees can play an important role in promoting its goals and missions. Based on the significance of organizational climate and OCB in organizational behavior management, a few studies in two variables in administrative environments obliged the researcher to evaluate the relationship between organizational climate and OCB among staffs of Education Department of Isfahan City. By this study, we can present information to education authorities to use it in planning, employment, hiring, and selection of employees, etc. This issue is significant as by the evaluation of organizational climate in organization, we can have a great effect on the improvement of trend and activity and increase of return of employees. There is a significant difference between views of respondents about organizational climate and OCB based on demographic variables (gender, age, education, field of study, work experience, organizational position, and service location). Based on study hypotheses, the conceptual model of study is shown in [Figure 1]. In this study, Organizational Climate Questionnaire of Sasman and Deip and Kerondle citizenship behavior is applied, and dimensions and components of each variable are shown in conceptual model. The purpose of the study was to analyze the relationship between organizational climate and OCB among staff members in the Department of Education in Isfahan City. The study method was correlation. The study population was staff members of the Education Department in Isfahan City as 517 during academic year 2014-2015. By Krejcie and Morgan sampling table, 220 people were selected by stratified random method. The data collection measure was two questionnaires. The Organizational Climate Questionnaire of Sasman and Deip consists of 20 items and 7-item Likert scale (totally agree to totally disagree). This questionnaire evaluates the components of goals, role, rewards, procedures, and communication in organization. The reliability of this questionnaire was 0.91 by Cronbach's alpha coefficient. To evaluate OCB, OCB questionnaire of Kerondle with 29 items and 7-item Likert scale (totally agree to totally disagree) is used. This questionnaire evaluates helping behaviors, organizational obedience, sportsmanship, organizational loyalty, individual initiative, civic virtue, and self-development. Reliability of questionnaire was 0.91 by Cronbach's alpha. Face and content validity of two questionnaires are investigated by some of the respondents and authorities. For analysis of data, Pearson correlation coefficient, stepwise regression, multiple variance analysis, and Statistical Package for the Social Sciences (SPSS) software, version 19 were used. There is a significant association between organizational climate and its dimensions (organizational goals, role, rewards, procedures, and communication) and OCB of staff members of the Education Department in Isfahan City. 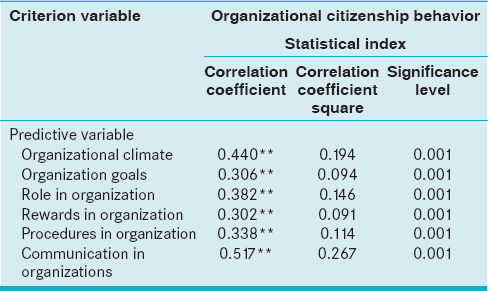 As shown in [Table 1], correlation coefficient between organizational climate (r = 0.440, P < 0.01) and its dimensions (organizational goals, role, rewards, procedures, and communication) is significant. Based on the coefficient of determination % (r2 = 19.4), organizational variance with OCB is common. Organizational climate dimensions predicted OCB. As shown in [Table 2], among the study variables in regression, the best predictor of OCB is communication in organization. Thus, in the first step, coefficient of communication in organization explains 26.9% of OCB variance. The findings of [Table 2] show that in the first step, the coefficient of communication in organization explained 26.9% of OCB variance. The findings of table showed that beta coefficient for one unit of increase in communication in organization increased OCB as 0.519. There is a significant difference between opinion of respondents about organizational climate and OCB based on demographic variables (gender, age, education, field of study, work experience, organizational position, and service location). The results in [Table 3] show that there is a significant difference between organizational climate and age and OCB with education, and the tests in [Table 4] and [Table 5] show the difference between groups. The results in [Table 5] show that there is a significant difference between organizational climate scores of people aged 35-45 or above 45. The results of data analysis showed that there was a direct and significant association between organizational climate and its dimensions (organization goals, role in organization, rewards, procedures, and communication in organization) with OCB. These findings are consistent with the results of Shaymy et al., Aghaee et al., Amini, Safarzade et al., Zamanim Moghadam et al., and Cilla Michael, and they are not consistent with the results of a study of Sabzipour et al., regarding the lack of relationship between organizational climate and OCB of librarians of public libraries of Iran. The lack of consistency is regarding the difference of study population and the effect of context factors in this regard. Results of multiple regression showed that among organizational climate components, communication in organization was the best predictor of OCB. This finding is consistent with the results of Ahmadizade. As it was said, we can say by improving organizational climate, OCB of employees is increased and this includes growth of employees and organization. If the organization goals are clear for the staffs, the people are effective on organization goals considerably and employees can dedicate their time to work issues of other staffs well and they want to dedicate time to train new staffs and be present at work place more. If the received rewards of employees reflect their activities and they receive reward based on their activity, membership in organization is satisfactory for people, organization decisions are taken in an effective manner, existing stimulations can create motivation, these factors can increase the effectiveness of people in helping the organization, and people are proud of being in organization and defend against criticism of people outside organization. For growth and progress, organizations need open and healthy organizational climate to provide mental health of employees. According to the results, communication in organization is the best predictor of OCB. When employees are interacting continuously, they are informed of their job issues and can transfer work issues to each other and receive adequate feedback from other staffs for their performance and in this case, work place can be attractive and people work beyond their duties and roles. The people with the age above 45 years evaluated organizational climate better than other co-workers at low ages. In other words, establishing human relations was easier by these people and this provided mental health of employees. According to pairwise comparison, the mean of OCB scores in terms of education with associate degree compared to the staffs with BA stated to have higher OCB. Creating positive and good organizational climate requires a culture based on common values, and employees can tolerate their work problems and their loyalty to organization is increased. Luthans F, Luthans KW, Luthans BC. Positive psychological capital: Beyond human and social capital. Bus Horiz 2004;47:45-50. Lunenburg FC, Ornstein AC. Educational administration: Concepts and Practices. 4th ed. Florence, KY: Wadsworth; 2004. Hoy WK, Miskel CG. Educational Administration, Theory, Research and Practice. 5th ed. New York: McGraw-Hill Inc.; 2001. Hoy WK, Tarter CJ, Kottkamp RB. Open Schools/Healthy Schools: Measuring Organizational Climate. Beverly Hills, CA: SAGE; 1999. Dehdashti Shahrok Z, Abdul Ali H, Dvstkvhy MM. The relationship between climate factors and emotional intelligence in organizations. J Tadbir 2012;23:42-50. Sobhaninejad M, Yuzbashi A, Shateri K. Organizational Citizenship Behavior. 1st ed. Tehran: Ystrvn Publication; 2010. Kerondle TA. Antecedents and Consequences of Organizational Citizenship Behavior: A Hierarchical Linear Modeling Study. Ph.D Thesis, University International of Touro, New York, USA; 2007. Kianfar V. Structural Equation Model of Organizational Trust and Organizational Citizenship Behavior and Intellectual Capital in the West′s Public Universities. Ph.D Thesis, Department of Psychology, University of Isfahan; 2013. Podsakoff PM, Mackenzie SB, Paine JB, Bachrach DG. Organizational citizenship behaviors: A critical review of the theoretical and empirical literature and suggestions for future research. J Manage 2000;26:513-63. Tabarsa G, Ramin Muhar H. Offer model organizational citizenship behavior. J Outlook Public Adm 2010;3:103-18. Mehdad A, Mehdizadegan I. The comparison of Organizational Citizenship Behaviors (OCBs) and Counterproductive Work Behaviors (CWBs) among Iranian and Malaysian Automotive Workers. New findings in psychology, 2009;4:79-93. Shaymy A, Shabani J, Chali N, Khazaeipool J. Analyzing the impact of perceived organizational citizenship behavior. J Nurs Midwifery 2014;24:27-37. Aghaee R, Aghaee M, Aghaee A. Investigation of relationship between job fatigue, organizational citizenship behavior and organizational atmosphere. J Public Adm 2013;5:1-18. Amini M. The Relationship between Organizational Climate and Organizational Citizenship Behavior Staff Tehran Municipality Sports. Master Thesis, Faculty of Physical Education and Sport Sciences, University of Teacher Training Tehran; 2012. Safarzadeh S, Naderi F, Askari P, Enayati MS, Heydari A. Innovative relationship between organizational climate and career aspirations with organizational citizenship behavior in female employees. J Women Cult 2012;4:69-82. Ahmadizadeh Z. The Effect of Personality Characteristics and Organizational Climate on Organizational Citizenship Behavior General Administration of Sport and Youth Astan Mazndran. Master Thesis in Department of Physical Education. Martyr Chamran University; 2012. Zamanim Moghadam A, Parsa Ziabari L, Fathizadeh S. Examine the moderating role of organization internal factors on the relationship between organizational citizenship behavior and performance. J Manage Res Spec Issue 2012;23:65-76. Sabzi Pour M, Ahmadi Zad A, Esmaeili Givi M. Analysis of the relationship between organizational climate and the attitude and behavior beyond the role of public libraries in human resources. J Res Sci Inf Public Libr 2011;17:581-602. Faizi T, Emadi Z. The relationship between organizational citizenship behavior and organizational climate at the ministry of science, research and technology. J Educ Manag Plann Syst 2010;3:98-115. Cilla Michael J. Exploring the Relationship between Organizational Citizenship Behavior and Organizational Climates for Creativity. MSc Theses and Graduate Research; 2011. p. 1-81. Dipaola MF, Tschannen Moran M. Organizational citizenship behaviors in school and its relationship to school climate. J Sch Leadersh 2001;11:424-47. Zarei Matin H, Jandaghi G, Toure N. Recognition factors organizational citizenship behavior and its relationship with organizational performance. J Manage Cult 2006;4:31-63. Akhvanz P, Abu Ali M. Examine the Role of Knowledge Management in Innovation. The Second National Conference of Creativity, Engineering and Innovation Management, Tehran, Home Teacher; 2010.